I arrived at a local bonsai sale just before it closed. Most of the tables were empty; all the gems had found new homes. However, one slant-style pine caught my eye: an older tree with gentle trunk movement. Slant style or just falling over? Its exposed nebari and flaky bark suggested age. Despite its very low price, no one had grabbed it. Perhaps its flaws had overwhelmed potential buyers. This slant style had a trunk which lacked taper; the lower two thirds of the trunk had no branching. Midway up the trunk was a large, ugly branch cut. The branches were long and leggy. The lower left and right branches resembled a long, horizontal hot dog. To slant this tree, the rootage on the left side rose out of the pot, making the tree feel unstable. 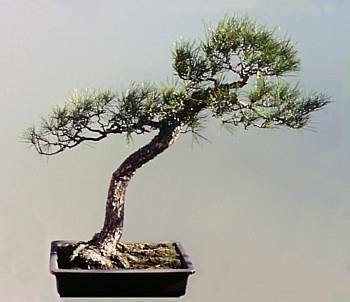 Flaws of this slant – a taperless trunk with no lower branches – would be features on a bunjin. 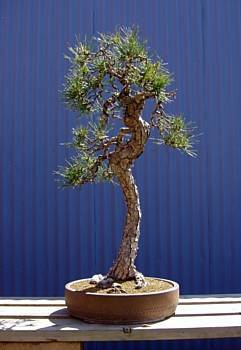 Once the tree was repotted in a drum pot with a more upright attitude, the rootage was level and the tree was stable. The new front was chosen to hide the ugly branch cuts and maximize trunk movement. The branches were brought closer to the trunk, but the leggy branching in the apex was so long that the silhouette was cylindrical instead of triangular. Moreover, above the lower left branch were unsightly bar branches. The apex was trimmed back. The saw cuts were hollowed slightly to remove the evidence of human touch, but they were never going to be features, so the new front was still a better choice. 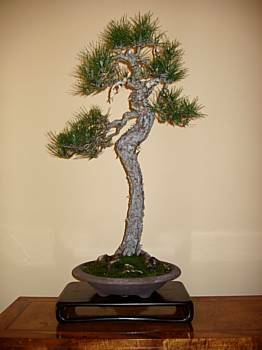 The left bar branch was removed, but the jin was retained (better than a saw cut) and the tree was repotted in a more appropriate bunjin pot. Overall, the tree was shaping up nicely – but upon closer inspection, several flaws were more distracting than ever. This tree looked like it was having a very bad hair day, with branches going out in all directions. The branch on the right side exited the trunk with an upward angle, then folded back onto itself (follow the red line) to bring it closer to the trunk. An upper left branch (purple line) also flowed up and away from the trunk. Both were in sharp contrast to the lovely downward angle of the first branch. The jin remaining after the left bar branch had been removed was too long. It gave the visual impression of a bar branch; worse still, it would have interfered with the proper downward positioning of the upper left branch. 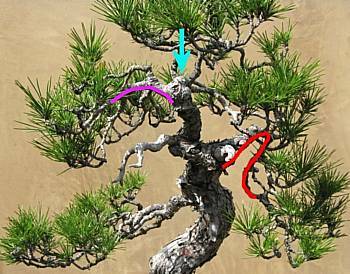 The jin was therefore shortened by 75% before positioning the adjacent branch. But the big question was “Where did the upper trunk go?” It seemed to disappear (the arrow marks the spot) where the upper left branch emerged. The mystery of the disappearing trunk was solved by looking at the side view. The upper trunk folded backward at an unfortunate angle. Small branches emerged from the apex in bizarre positions to create a soft crown. The remedy for all these flaws was to wire and shape the upper branches and apex. To unfold the upper trunk, a small cut was made on the back side. Wire was applied, the trunk was pulled up about 45 degrees and angled toward the right, and cut paste was pressed onto the cut. 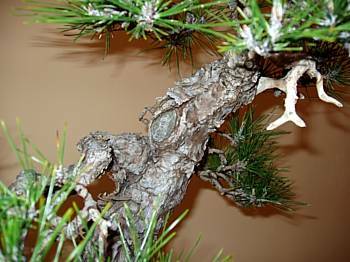 Pine branches are quite flexible when small. But after older growth has hardened and is no longer flexible, dramatic bends are still possible. The pine is more tolerant of cracks and tears; it will completely heal in time. Application of wire and shaping the branches completes the design. The upper branches now replicate the shape of the first branch. The downward angle of the branches exudes age that harmonizes with the character of the trunk and nebari. Unfolding the upper trunk towards the right produces more movement, better taper, and a three-inch height increase (to 34 inches). 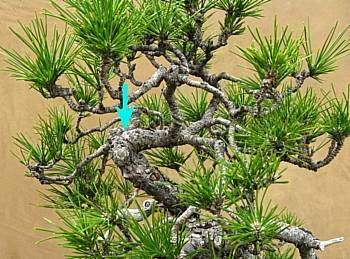 By bringing the branches closer to the trunk and raising the apex, the main focus becomes the interesting trunk. 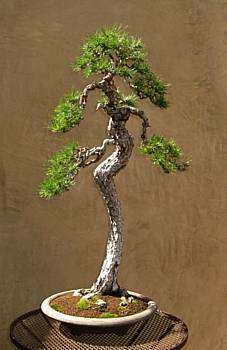 With its delicate equilibrium between a thin trunk and well-defined branches, this tall tree – once a neglected, unstable slant – has become a beautiful, balanced bunjin. © 2011 Cheryl Manning. All rights reserved.